A quality 1080p GPU marking a return to gaming form for the lower-caste Kepler cards. A sure sign that Spring has sprung, aside from frolicking bunnies and chocolate-egg-induced sugar-comas, is the sudden abundance of new GPU slews. 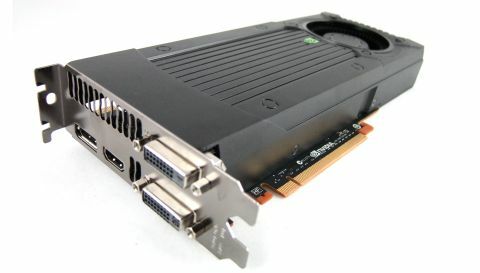 From AMD we get the disappointing Radeon HD 7790 , while Nvidia retort with the new, improved GTX 650 Ti Boost. Based on the same GK 106 GPU as the standard GTX 650 Ti - and the straight GTX 660 - this Boost version comes with a much quicker base clock. The original GTX 650 Ti landed with a modest clock of 928MHz where this Boost version is hitting 980MHz, but with the addition of the GPU Boost tech allowing it to push beyond 1GHz in most games. If it was simply a matter of overclocking the standard GK 106 GPU, I wouldn't be quite so fussed about Nvidia's latest graphics card, but they have also taken the important step of widening out the memory bus. Going from a miserly 128-bit up to a 192-bit bus gives this new iteration of the GTX 650 Ti much better performance in-game and finally allows Nvidia to deliver some proper 1080p power down at the sub-$200/£150 price point. They've also boosted the memory speed up to the now-standard 6GHz that the top cards are all now sporting. Nvidia has essentially based the reference design on the same PCB as the pricier GTX 660, giving it the same number of ROPs as well as the same memory bus. That also means you're able to SLI this GTX 650 Ti Boost - something you couldn't do with the original design. That's not a terribly attractive option, however: a pair of these cards would only be slightly cheaper than buying a single HD 7970 GHz Edition, and - I can't stress this enough - you're far better off spending your money on a better single card than attempting a notoriously unreliable multi-GPU set-up. Nonetheless, the GTX 650 Ti Boost is a very impressive card and represents a complete reversal of form for the two hardware giants AMD and Nvidia. Formerly the budget card masters, AMD have ended up replacing their excellent HD 7850 1GB with the mediocre HD 7790 for the same price. That's not quite the refresh we were hoping for. Nvidia, on the other hand, have improved on the existing silicon in practically every area and aren't charging any more than they were for the original GTX 650 Ti. "Nvidia have improved on the existing silicon in practically every area and aren't charging any more than they were for the original GTX 650 Ti." The only real fly in the ointment for Nvidia is the fact that AMD's HD 7870 XT - the Tahiti LE-based card - is only a little more expensive and a far more capable card. But if you're sticking rigidly to the sub-£150/$200 price-category, it's now all about the GTX 650 Ti Boost. Compared with the similarly priced HD 7790 it really is no contest and, for the most part, it bests even the HD 7850 2GB card in my tests too. The only place where the AMD cards can still claim some superiority is in the minimum frame rate scores. Of course, that's arguably as important as the average frame rate: when a game drops to its lowest ebb you really notice poor performance. But while the HD 7850 2GB still has higher minimum frame rates across the board, the HD 7790 is generally on a par with the GTX 650 Ti Boost. When the Boost is also hitting higher FPS on average then it's still the card I'd choose. It's a rare triumph for Nvidia in this volume segment, with a quality 1080p card and some very sensible, and very welcome, design improvements.